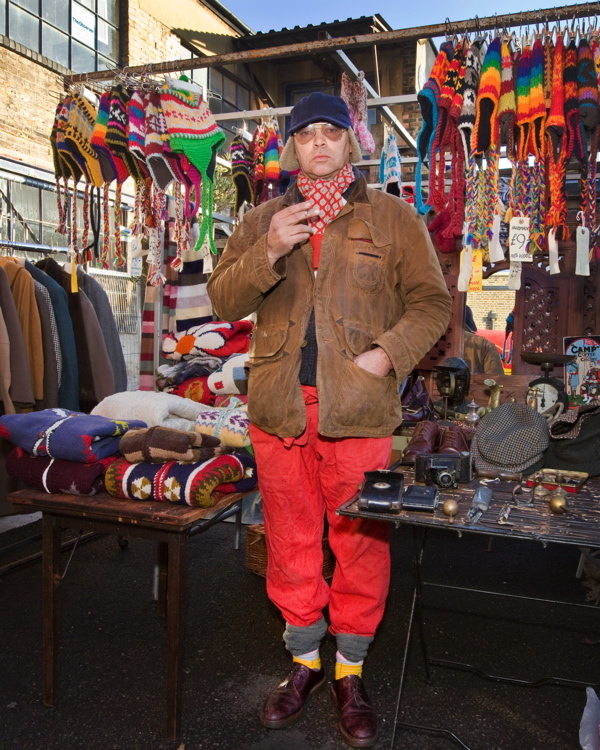 Rambling round the markets of the East End has long been one of my favourite pastimes. It is a curious terrain, a constantly shifting landscape, with the potential for new discoveries ever present. 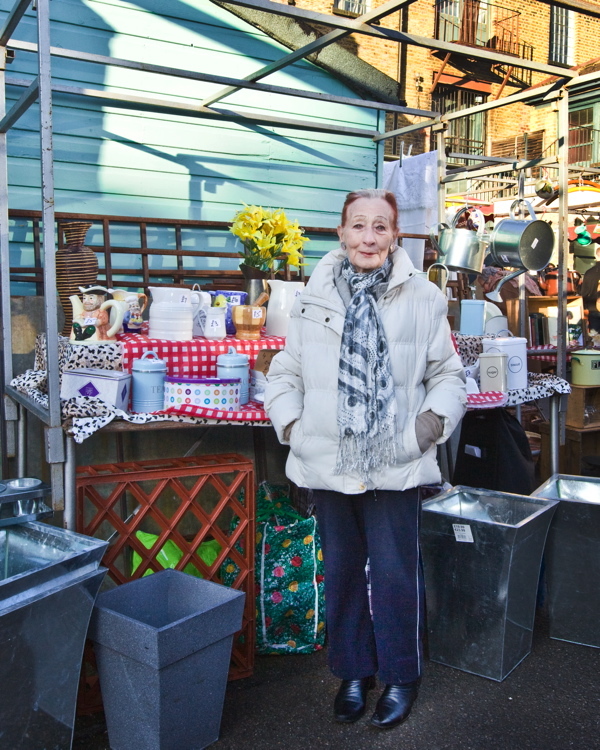 So I was delighted when Spitalfields Life contributing photographer Jeremy Freedman sent me this set of six portraits of traders from Ezra St Market that he took last Sunday. He stumbled upon it in the early morning after taking Columbia Rd portraits, and this is his note that accompanied the pictures,“As dawn broke this morning, I found myself coffee less and in need of nicotine, so I followed my nose. In a lovely yard off Ezra St is quite possibly the friendliest market I ever ventured into. I couldn’t help myself. I was flashed up and at war with the rising sun – notice the crisp Autumn sky!” Captivated by the appeal of these spontaneous portraits, I set out to find the subjects for myself. 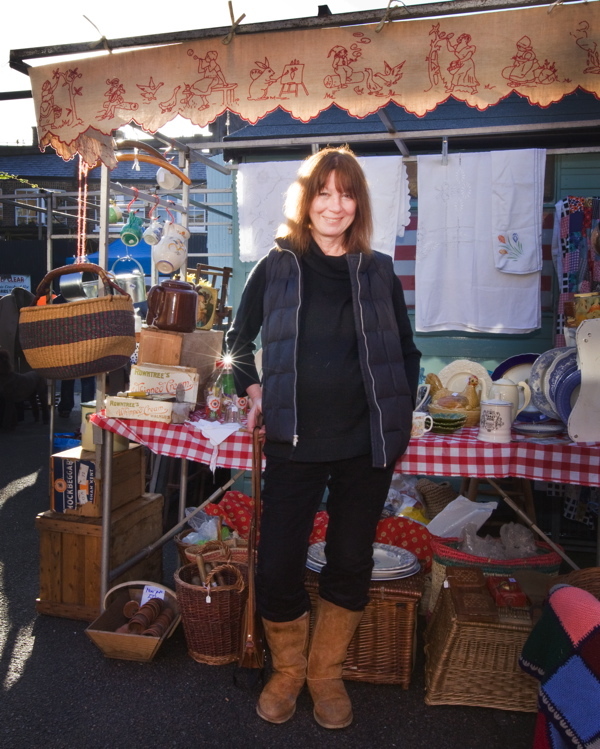 This is Suze Hails who deals in antique textiles and linen. “I am a grandmother and a mother and a carer for my husband, so this is a fun day out for me coming here,” she revealed excitedly, “I came from Kenya originally to study Fine Art & Etching at the Central School of Art, but then before I got going I found myself bringing up three children.” A natural enthusiast, Suze brings her artist’s eye to the selection of vintage fabrics and knows how to wear a duffle coat better than anyone I know. This is distinguished gardening writer Caroline Foley in her Sunday guise as a trader in old china, baskets and gardening equipment. “This is a sideline,” she told me, “since I spend so much time on my own writing, it is lovely to get out in the world meeting people.” Caroline has published nine books in the past ten years, and her latest, The Allotment Source Book is published today. She also edits “On Topiary” magazine for the European Box Hedge & Topiary Society. 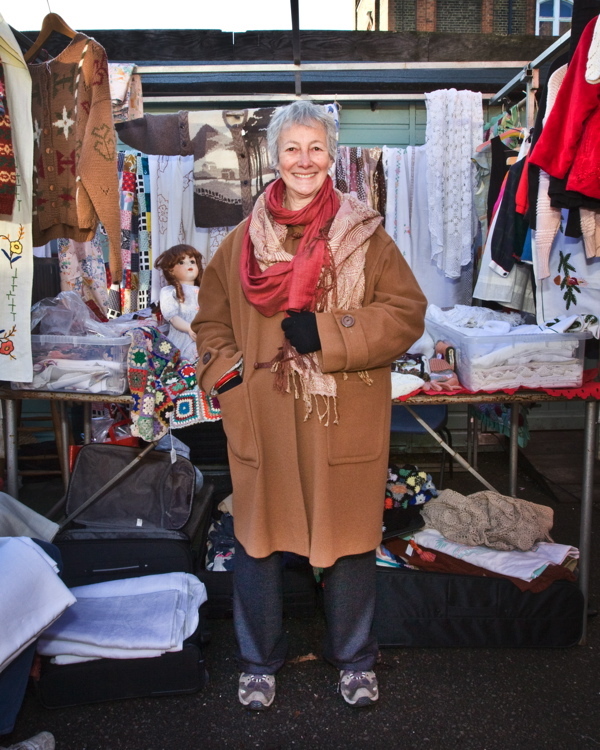 Yet I found Caroline most passionate about Ezra St Market, “In this bit, there’s great camaraderie. We all stick together through the good times and the bad.” she said. You can read Caroline’s monthly allotment column for the Observer by clicking here. This is Ezra himself. Ezra of Ezra St Market, Ezra Quinn. Even from his demeanour, I surmise he is a gentleman of singular personality, quite possibly a raconteur. From his trousers, I also presume he is either a cyclist or a style eccentric, if not both. The fancy silk scarf and wonderfully weathered fishing jacket are characteristic of the swanky hauteur with which he wields his cigarette. 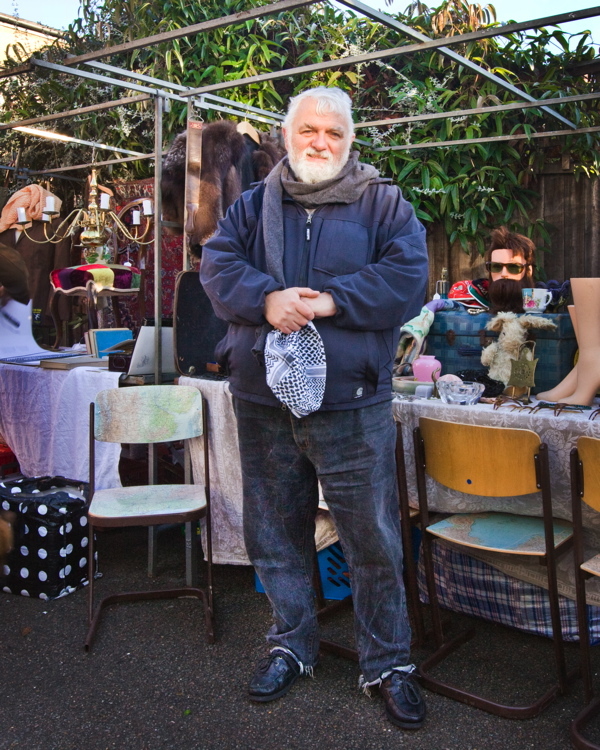 A dealer in Peruvian knitwear and metal curios, carriage lamps, scales and cameras, Mr Quinn remains an enigma to me – because I never met him. He was not there when I visited Ezra St Market. In a charismatic shabby yard in a hidden corner of Ezra St, a group of unlikely characters have created their own lively community that exists for just one day every week. Let me admit, I was innocent of the intrigues and gossip, but now I have introduced the appealing personalities of the leading characters in the weekly drama that is Ezra St Market, be sure to pay them a call next Sunday and introduce yourself. Delightful photographs of a special place. 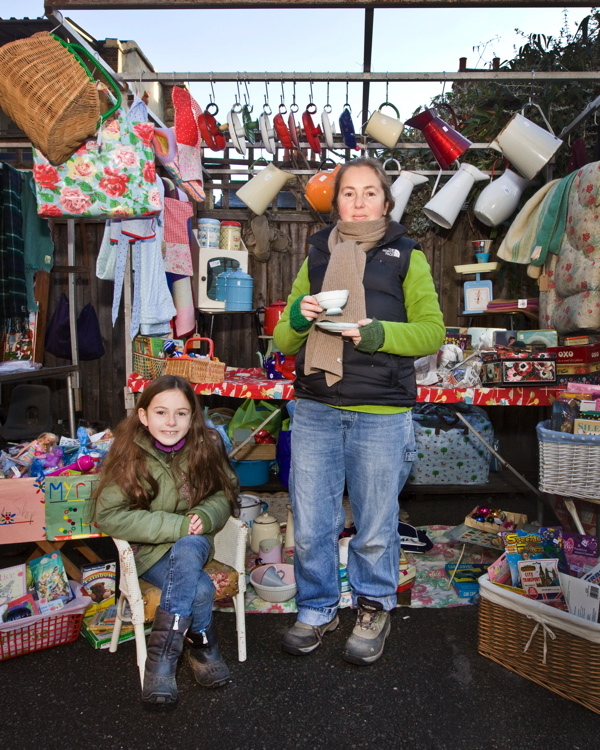 I love the way the subjects are embraced by their stalls creating a delicate balance between stall holders and the environment they have created. This morning I gave in to necessity and donned long underwear for the first time this autumn. It was a real lift to see these cheery, bundled up market vendors looking chic in their layers.